But excluding Tehran will only make the peace conference that much harder. For a brief moment this past weekend, just for a brief moment, it seemed as if sanity might prevail in preparing for the Wednesday start of Geneva II, the Syria peace conference in Montreux and Geneva, Switzerland. That’s because Ban Ki-moon, the secretary-general of the United Nations, saw fit to defy the United States and deliver an invitation to Iran to take part in the conference. For months and months, the United States has opposed the inclusion of Iran in the talks, scheduled to begin January 22 after many postponements and false starts since last summer. For most diplomats, excluding Iran is—or ought to be—the literal definition of insanity: if you’re having peace talks, it’s generally a good idea to have the other side present. And in the case of Syria, Iran—along with Russia—is President Bashar al-Assad’s closest ally and supporter. Not only that, but Iran’s new leadership, including President Hassan Rouhani, is looking for better relations with the United States and the West, and if there is to be a settlement of the civil war in Syria, then Iran will certainly play a role. Or, obstruct things. And let’s face it: Assad isn’t going anywhere. Belatedly, long after Obama made the egregious error of calling for Assad to quit—a call that emboldened the opposition and sent a signal to Saudi Arabia, Qatar and other Persian Gulf Arab kleptocracies to unleash a flood of support—the United States has gradually come to realize that Assad will remain in power for at least the medium-term future, and he may very well run for re-election in June. Despite the machinations of the ineffective, outside opposition that spends its time in hotels and offices in Cairo, Turkey and the Persian Gulf, Assad is making military gains across the board and racking up political gains too. In September, by agreeing to the deal to dismantle Assad’s stockpile of chemical weapons, the United States in effect acknowledged that Assad will have to remain in place in order to implement the deal through at least the middle of 2014. And Secretary of State Kerry, joined by his Russian counterpart, has welcomed Assad’s representatives to the table in Geneva, despite the great unhappiness that provoked among the Syrian opposition. After nearly three years of fighting in Syria and persistent calls for a new caretaker government there, U.S. policy toward the country’s grinding civil war is tacitly acknowledging what has long been obvious: President Bashar al-Assad will remain in power, at least for a while. 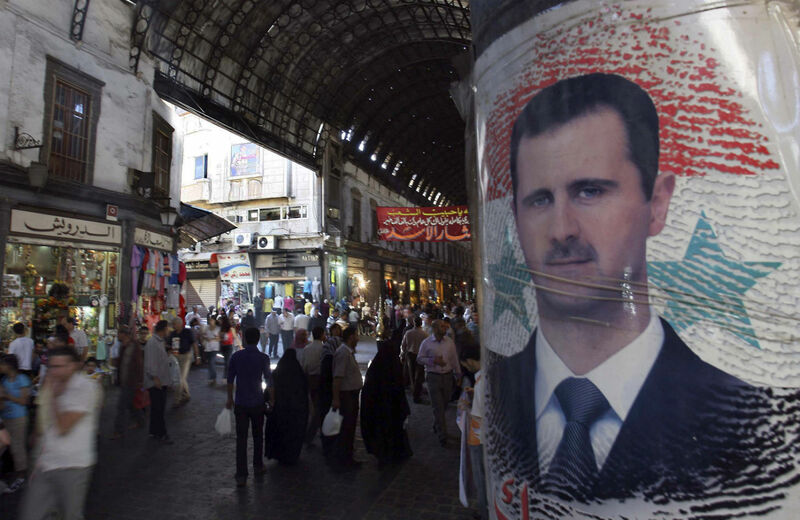 Although the official U.S. line is that Assad “must go,” the focus on striking even short-term bargains with his regime is a recognition that he retains a strong political hold. Already, as The New York Times reported last week, the Syrian government is seeking to create ceasefire zones, starting with the city of Aleppo. American officials said they had been in regular communication with the United Nations over the requirements Iran would need to meet to be invited, but they appeared to have been caught off guard by Mr. Ban’s hastily organized news conference. They pointed out that Iran had not publicly accepted the formal mandate for the conference, which was agreed upon in Geneva in 2012 and is known as the Geneva communiqué. Great fulminations followed from the State Department. And the next day, Monday, Iran was out. A big reason for the US demand to keep Iran out was the apparent decision by the ragtag Syrian opposition bloc that it would not go to Geneva if Iran did. A few days earlier, the opposition bloc—badly split—reluctantly decided that it would indeed take part in the peace talks. Then, when it seemed possible that Iran would also attend, the rebels said they’d back out. The Islamic Republic of Iran appreciates the efforts of the UN Secretary General and his special envoy, Mr. Brahimi, in seeking a political solution for the Syrian crisis. Iran has always been supportive in finding a political solution. However, the Islamic Republic of Iran does not accept any preconditions for its participation in any conference. If the participation of Iran is conditioned upon its accepting the Geneva I communique, Iran will not participate in the Geneva II conference. The job of diplomats is to find words that allow countries with differing political and military positions to find common ground. It’s clear, from the statements of Ban, Brahimi and Khazaee, that there was plenty of common ground to be found, if the right words were applied. But the United States was implacably opposed to Iran’s role, and that will make the talks in Geneva that much more difficult.